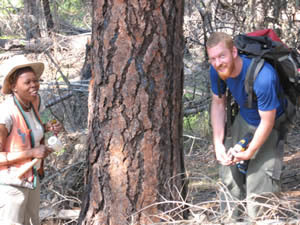 Cara Nelson joined the faculty at the University of Montana and established the Restoration Ecology Lab in 2007. The lab focuses on increasing knowledge about ecological processes and their application to the restoration of degraded ecosystems. Research in the lab focuses primarily on ecosystems of the western United States, although Cara has recently developed collaborations in temperate forests of South America and dryland ecosystems in the Middle East. In addition to her research contributions, Cara serves as the Director of the College of Forestry and Conservation’s Ecological Restoration Program and as the Associate Director of Ecological Restoration for UM’s Center for Integrated Research on the Environment. Cara also teaches courses on the science and practice of ecological restoration, and contributes to the field of restoration by serving as Chair of the international Society for Ecological Restoration. Read more about our work, featured in local, regional and national news outlets.